RIVERSIDE, Calif. – Researchers at the University of California, Riverside have made a discovery in the lab that could help drug manufacturers develop new antiepileptic drugs and explore novel strategies for treating seizures associated with epilepsy – a disease affecting about two million Americans. 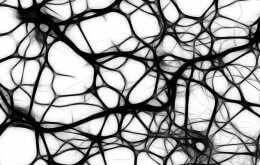 Neurons, the basic building blocks of the nervous system, are cells that transmit information by electrical and chemical signaling. During epileptic seizures, which generally last from a few seconds to minutes and terminate spontaneously, the concentrations of ions both inside the neuron and the space outside the neuron change due to abnormal ion flow to and from neurons through ion “channels” – tiny gateways that are embedded to the surface of the neuron. Ordinarily, intracellular (inside the cell) sodium concentration is low compared to extracellular sodium (the reverse is true of potassium). During seizure, however, there is a buildup of intracellular sodium, with sodium ions moving into neurons from the extracellular space, and potassium ions doing the opposite. To understand exactly how neurons function during epileptic seizures, Maxim Bazhenov, an associate professor of cell biology and neuroscience, and Giri P. Krishnan, a postdoctoral researcher in his lab, developed and used realistic computer simulations in their analyses and found that while there is a progressive and slow increase in intracellular sodium during seizure, it is this accumulation of intracellular sodium that leads to the termination of the seizure. 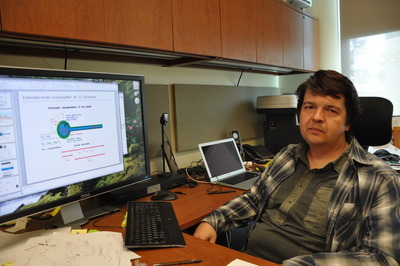 The researchers’ computational model simulates the cortical network. (The cortex is the outer layer of the cerebrum of the mammalian brain. A sheet of neural tissue, it is often referred to as gray matter.) The model simulates neurons, connections between neurons, variable extracellular and intracellular concentrations for sodium and potassium ions and variable intracellular concentrations for chloride and calcium ions. Bazhenov explained that conventional antiepileptic drugs are commonly designed to target various sodium channels in order to reduce their activity. According to Bazhenov, targeting the sodium channels is not the best approach for drugs to take. He explained that even for drugs to increase the activity of the sodium channels (in order to reduce seizure duration) there is an undesirable effect: seizures become more likely. Bazhenov and Krishnan’s model also shows that the occurrence of seizures depends critically on the activity of ionic “pumps” – structures that are also embedded to the surface of neurons. These pumps help remove the sodium and chloride ions from inside the neurons and critically influence their concentrations in the brain. Study results appear in the June 15 issue of The Journal of Neuroscience. The research was supported by a grant to Bazhenov from the National Institutes of Health. Epilepsy is a chronic neurological condition characterized by recurrent seizures – involuntary changes in body movement or function, sensation, awareness or behavior. The seizures are caused by abnormally excited electrical signals in the brain. It is estimated that about 10 percent of people will experience a seizure some time during their lifetime; about 3 percent will have had a diagnosis of epilepsy by age 80. Epilepsy cannot be transmitted from person to person. No definite cause for epilepsy has been identified. 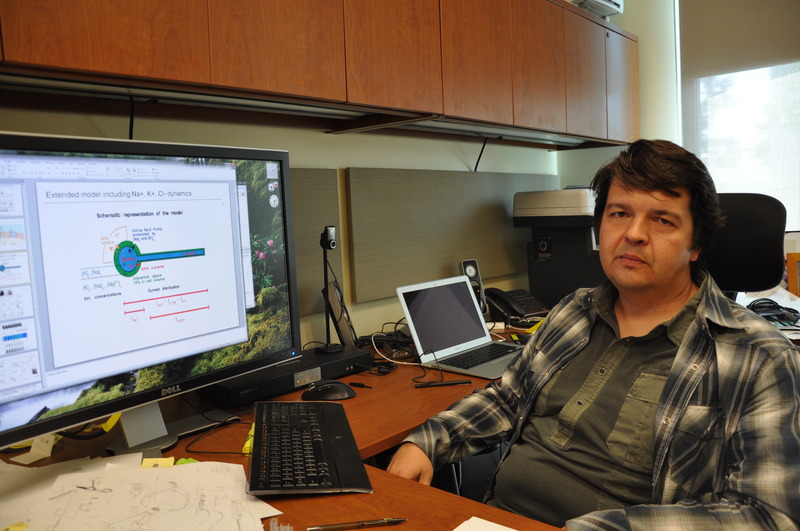 Maxim Bazhenov is an associate professor of cell biology and neuroscience at UC Riverside. Photo credit: UCR Strategic Communications.